The SV80ST Imaging System comes with a Stellarvue SV80ST-25SV with Stellarvue's proven 2.5" fully rotating focuser, 2" and 1.25" compression ring adapters, dual heavy duty American made CNC mounting rings, certified, extremely high Strehl optics, a C19 airline carry on case, and the Stellarvue SFF3-80 field flattener. This flattener converts the SV80ST into a wide field, full frame 480 mm f-6 astro graph. This is the wide field triplet to buy if you want to use a telescope both visually and with a full frame or smaller camera. 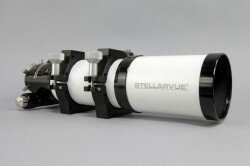 Fully multicoated apo triplet objective: The high Strehl, apochromatic triplet objective is triple-tested at Stellarvue to ensure that it performs perfectly. Lenses are better than .96 Strehl, better than our former Russian made lenses. We are now taking the time to provide interferometric test reports with each of our triplet refractors showing how the lens in your telescope actually performs. Hitting a Strehl ratio of at least .95 means your telescope will perform perfectly. These lenses rate even higher. Each lens focuses light precisely and in addition the extreme broadband coatings on each surface enhance it even further. Using it visually, the stars appear vivid and the background, velvet black. Since these coatings transmit more than 99% in the visual spectrum and far above and below it, reflections seen on CCD images are eliminated. The relatively fast speed and high Strehl optics make the 80 apo an excellent wide field imaging telescope while the visual performance is simply stunning.